for $695,000 with 3 bedrooms and 2 full baths. This 2,024 square foot home was built in 1997 on a lot size of 228.0000 Acre(s). FARM that Produces for Sale in the South Central MO. Farm is a Commercial Hay Operation - fertilized & tested soils for optimal levels for high yield. Property currently planted with 55 acres of Alfalfa & 25 acre in orchard grass with 30 pair ran on remaining land. Wooded land with some of the best hunting you will find includes some marketable timber. BUILDINGS INCLUDE: Large hay barn 60x105 with a 30x135 lean-to -Shop 30x40 with a 4 bay machine shed 30x64 -36x12 cover with a 14x12 shed, 34x12 barn with pipe pens and A-1 working facility under cover. Pipe corners with excellent fence throughout farm. Quality, well kept Brick & Stone home with over 2000+ Sq Ft sets off the road for privacy. 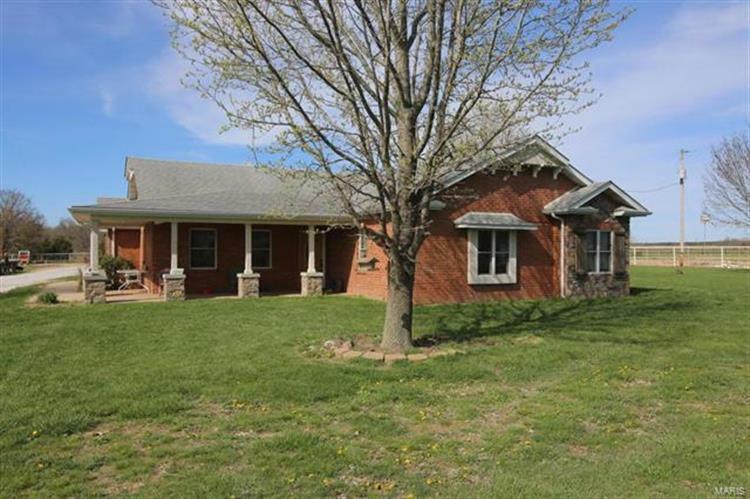 Home offers 3BD/2BA, bonus room with fireplace, Anderson Windows & storm shelter.